Now based in Taupo Jason and Lorna are two full time amateur kiwi/english adventurers, adventuring their way around New Zealand, setting a goal to finish New Zealand’s 9 Great Walks by the end of summer and want to share their adventures with friends, family and fellow adventurers. Over the last 3 years they have travelled New Zealand north to south, east to west and most places in between. Seeing our stunning countryside, met great locals, travellers and wildlife. immersing themselves in the epic nature and beauty that New Zealand has to offer – hiking, camping, driving, surfing, diving, fishing, cycling, kayaking, sailing and flying our way around the country meeting amazing locals and travellers, living the Kiwi Dream. Three years ago Jason and Lorna “Living the Kiwi Dream” went down to the South Island of New Zealand with friends for new year and walked/kayaked the Abel Tasman track. they loved it so much that they started looking into what are known as the New Zealand ‘9 Great Walks’. Awed by the pictures and excited by the prospect of exploring this amazing country further, they decided to set themselves the goal of completing all 9 walks. During work holidays they set off on adventures, starting to tick off the walks one by one. Three years later having just completed their final walk, the Tongariro Northern Circuit. This blog is a short reflection on each walk, the highlights, a bit about the logistics and any handy hints picked up along the way. The order of the walks is the order in which they completed them. Situated at the top of the South Island, a scenic drive from Nelson, Abel Tasman is best known for its beaches. The track certainly lives up to its reputation. We embarked on this adventure as group of 6 friends over New Years. The first highlight was beginning the first day of our ‘walk’ in sea kayaks. This gave us a chance to see a different perspective, exploring the beaches accessible on the walking track, but also islands only accessible by sea. This mode of transport gave us great access to wildlife, looking out for penguins, local bird life and interacting with curious seals who danced around the kayaks. The track itself is very accessible, with a number of companies available to pick you up from nelson, provide kayaks and drop off and pick up from the beginning/ end of the track. Also, in terms of terrain, this walk is suitable for many ages and abilities, with a well maintained track, fewer challenging inclines and the availability of huts/campsites to make the days as long or as short as you like. Another good thing to know about this trip is that there is a water taxi available to transport your packs between huts/campsites. This was useful to us as we wanted to pack a few beverages for New Years celebrations on the track, but didn’t have to carry heavy bottles along with us! The beautiful beaches to explore and many accommodation choices to allow shorter days, makes this track suitable for all the family to enjoy at a leisurely pace. If you are looking for more of a challenge, longer days and carrying your own packs would also be a great option. 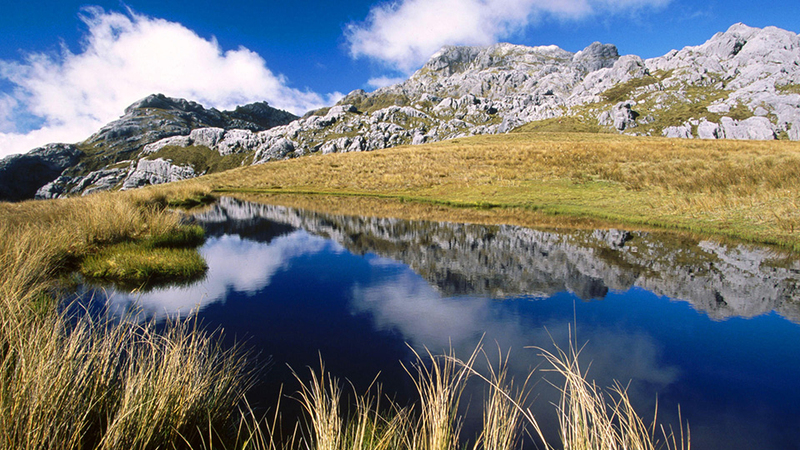 The Milford Track is probably the best known track of all. Due to this, it does get booked out months ahead, so some forward planning for this one is important. Located in the South Island in Fiordland, a very remote part of the country, booking logistics is also necessary. This usually involves a bus to a boat, a wonderful boat ride through the sounds to the start of the track, a boat from the end of the track (from Sandfly point, very aptly named, bring repellent) and a bus back to your base. There is no denying that this track is stunning. In fine weather, the towering cliffs and mountains either side of the valleys, the view from the top of Mackinnon pass and the beautiful reflecting pools are real highlights. But the beauty of this track is that even in the rain, it is great. The rain turns into hundreds of waterfalls, cascading down the walls of the valleys and the infinite colours of green of the native bush become even more vivid. Another memorable part of the track is the bird life. The infamous alpine parrots- Kea, hang around the track and the huts, hoping for a feed or to ‘borrow’ a valuable piece of your hiking equipment. A good piece of advice from the DOC warden was to tie your boots together and hang them from hooks- making them harder for the Kea to pinch. They come close to huts and hikers, making for perfect photo opportunities and interactions with these inquisitive creatures. This track is more challenging both in terrain and track conditions than the Abel Tasman, so may not be quite as suitable for all abilities, but you can make the days as easy as possible, spreading your nights over more huts, ensuring that you get the opportunity to experience this once in a lifetime hike. The Heaphy Track in the Kahurangi National Park is the longest of all the Great Walks and the only one on the wild west coast track. It can either be walked from the West coast inland towards the east, or the other way around. There are 3 main options for transport logistics: Shuttle, flight or car relocation, the distance by road between the beginning and end is 400km, so this is important to consider before booking. Be aware that this track opens up as a mountain bike track during low season. The majority of the track takes you through tussock downs and lush forest, with one of the highlights being the coastal section. The track takes you along the wild west coast beach, with wind sculpted sand and rocks and lined with Nikau Palms. There are a number of fun swing bridges of all shapes and sizes throughout the walk to enjoy. This is a lengthy walk at 78km, but can be broken down to 6 days to make it manageable. The track is well managed, but with all tracks in bad weather can become muddy and wet. It offers a great opportunity to spot native wildlife, getting out at dusk and look out for the Great Spotted Kiwi and the cheeky Weka hanging out by the huts. Beginning and ending in Te Anau, this loop walk is easy to get to. Either park your car in one of the car parks, or take a short bus ride to the track. This is another popular track, with many trampers who can’t get a space on the famous Milford Track opting for this as an alternative, so booking accommodation quite far in advanced is necessary. But this track offers very different but equally breathtaking views to its sister track. The track takes you along the picturesque shores of Lake Te Anau, high up to ridge lines that feel like footpaths to the sky and down through beautiful tussock and bush lands. As well as the views, the wild life is another reason to walk this track. High on the ridge lines, Kea hang around on the tracks, coming close to pose for photos. Down in the Iris Burn Hut, on a dust walk to the river, you may be lucky enough to come across a Kiwi, as well as many other local wild life. The huts on this track are a great nights stay. The wardens in each hut offer a very informative talk each night, informing and educating on environmental and conservation projects that DOC is undertaking on the track. From new and luxurious and Luxmore hut, a 10 minute stroll takes you to the Luxmore caves, so don’t forget your torch. This easily accessible, well maintained track offers ever changing scenery and is a great snapshot of New Zealand wilderness that should not be missed. The Routeburn track is the joint shortest of the tracks (with Rakiura), but what it manages to pack into this short distance is impressive. The track can easily be walked over two days by relatively fit hikers, but can easily be extended to make time to take in the surroundings at an easier pace. This track is in the South Island and can begin in Glenorchy and end at The Divide, near Te Anau or vice versa. The walk is only 32km, but the drive from beginning to end of the track is impressively over 300km, so getting a shuttle from Queenstown or Te Anau is the best way to get around track logistics. It is also a very popular track, so accommodation needs to be booked well in advance. Highlights include Key summit with views over Fiordland National Park, an optional (but we would recommend mandatory) side track up to Conical Hill, the views from Routeburn Falls Hut and down the valley, Earland Falls and the glistening Lake Harris. There are a number of inclines, but with the shorter distances to cover, these are very manageable at your own pace. This short but action packed track is perfect for those short on time, and should be on any hikers’ must do’ list. Located on Stuart Island, off the bottom of the South Island, this walk is possibly the least walked but only due to location. We were very glad of this walk as it gave us the push to go over to Stewart Island. We decided to fly over to the Island which was a highlight itself in a tiny local plane, with us, 2 other humans and 2 dogs as the only passengers. There is also the option to go over on a ferry from Bluff. The track itself begins and ends in the Stewart Island township of Oban, a charming town which we would recommend spending a few days in before or after the walk. With it being a loop track, once you get to the Island, getting around can be done on foot. The Rakiura track is more relaxed than other tracks and takes you deep into the native New Zealand bush, along deserted wild beaches and past old forestry relics. Do be aware that during the wetter months, the mud can get ankle deep on the track. Although the views from this track may not rival those of other Great Walks, the real draw to this track is the nature and the wilderness. The bird life though out the entire island is plentiful, including on the track, with fewer pests than the main island. An early morning exploration showed us a Morepork and young deer just a stones throw away from the hut. The obvious highlight is the kiwi. At night, a short walk from the huts, you can hear the unusual calls from numerous males and females kiwis echoing throughout the bush. Walking along the track you can hear them crashing around and calling to one another. If you are lucky enough you will be able to see one of these elusive creatures first hand out in the wild, probably one of the ultimate wildlife experiences in New Zealand. We were lucky enough to come across a small kiwi running around the track in broad daylight, definitely one of the stand out highlights of all of the Great Walks. Despite being situated in the Te Urewera National Park, the middle of the north island, Lake Waikaremoana is far quieter than other tracks like the Tongariro. This makes bookings much easier and foot traffic less a lot less, giving you a much quieter and laid back feel on the track. The drive from Taupo is along a long winding road and is an adventure in itself, but as you arrive at Te Urewera DOC HQ and get your first views of the lake, a real feel of wilderness and natural beauty takes over. The track requires a water taxi at the end. It is not recommended that you leave your car at the beginning of the track, so this can be stored securely with the water taxi company, who drive you to the beginning of the track. The track gets straight into it beginning with a steep climb up Panekire Bluff, the views at the top of which are a definite highlight of the track. There a numerous lookouts along the top of the bluff to stop and take in the view and lots of photos. Another feature not to be missed is the optional side track to Korokoro Falls. Take your togs as your can climb onto a ledge behind the falls for a unique view. The track is DOC owned, but Maori run, with the hut wardens being hugely friendly and knowledgeable about the area and happy to answer the many questions hikers have. Most of the huts are situated on the lake, with wonderful views of the lake, bush and wildlife that lives in the area. After the initial climb up the bluff, the track generally follows the lake around and doesn’t pose too much of a challenge. If you have time, stay an extra day or two to explore more walks in the area. As the Whanganui River Journey is actually a canoe trip, the only non walk of the Great Walks, it naturally stands out. We went on this particular adventure with a group of 7, and would definitely recommend this for a group trip. The first plus is that you don’t have to carry a pack. All your equipment is stored in barrels and placed inside the canoes. This means that unlike carrying a pack, a few extra grams of luxury are much more manageable. We found that the canoeing was easier over the long distances than hiking, which would make it more suitable for different abilities. We opted for the 5 day option. A member of our group would not consider hiking the great walks, but thoroughly enjoyed this one. The journey is well organised. You book your DOC huts/camp sites and choose a canoe provider who drops you and your canoes off at the river with a detailed map and briefing of the journey and tips on how to navigate the rapids. At the end, they are there to pick you up from the river and return you to your cars. The views along the river are stunning, constantly changing throughout the journey from wide open rivers surrounded by farmland, to high towering cliffs either side. One of the side tracks is the Bridge to nowhere. This is a short hike into the bush and well worth the trip. The rapids really add excitement to the trip, with river levels changing the speed/difficulty of the rapids. If you read the instructions, although some of the rapids can be challenging, all are manageable and great fun is to be had trying. We found this the most unique of all the journeys. Having already hiked the Tongariro Crossing day walk, we were not entirely sure what other surprises and highlights to expect from the extended Tongariro Northern Circuit, which includes a large chunk of the day walk. We need not have been worried though, as well as the unrivalled terrain of the Red Crater, Emerald Lakes and Mt Doom (Ngaruhoe) from the day walk, the Taranaki Falls, Tama Lakes, lava fields, desert plains and views of the mountains were like nothing we had experienced before. The day walk only teases of what there is offer in the National Park. The track is very accessible, beginning and ending in Whakapapa Village with ample parking. Due to this and due to its fame across the world from the unique landscape and link to Lord of the Rings, bookings go quickly and need to be made far in advance. Another challenge with this walk is the weather. Being in such an exposed, mountainous area, it can be susceptible to snow, gales, sub zero temperatures and low visibility. Due to this, it took us 4 times of re-booking until we were able to get a good weather window, luckily that weather window was a perfect couple of days. The huts on the track all boast unforgettable settings and great facilities. The track itself is not the easiest of the walks, with steep inclines, very exposed areas and a section between Whakapapa Village and Mangatepopo Hut being very eroded and hard going. But again, it can be broken down into smaller sections. This track perfectly showcases the unique volcanic landscape that is like nothing else you will see in the country. The New Zealand Great Walks help to give both visitors and locals a rare opportunity to gain access to this amazing county’s wilderness, which without the help of DOC and their well maintained tracks and accommodation with amenities such as toilets and gas stoves, would remain inaccessible to many. We loved every moment on the tracks and encourage others to embark on the sometimes challenging, but absolutely unforgettable adventures of the Great Walks.